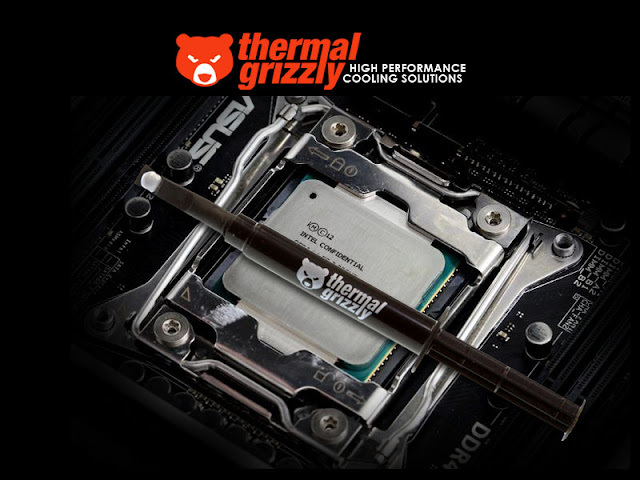 Thermal Grizzly is now the new king in the thermal paste market, and we have picked Kyronaut as the best thermal paste for 2017. “Kryo” – the greek word for “cold” – also found in the german word for “cryoengineering“, suggests that this thermal grease was created especially for cryogenic applications – for the true “Kryonauts” amongst the “extreme overclockers“. Kryonaut thermal paste was created especially for the extremely demanding applications and the highest expectations of the overclocking community. Kryonaut is also highly recommended as a top product for critical cooling systems in the industrial environment. Kryonaut uses a special structure, which halts the drying out process at temperatures of up to 80° Celsius. This structure is also responsible for the nano-aluminum- and zinc-oxide-parts included in the grease to compound optimally, to compensate for unevenness of the component (i.e. the CPU) or the heat sink, thus guaranteeing remarkable heat transfer. The packaging is rather simple and not as attractive as most of the renown thermal compounds that come in a hard plastic or fancy box, but probably this is a more preferred packaging as it’s way much easier to un-box when you’re in a hurry. 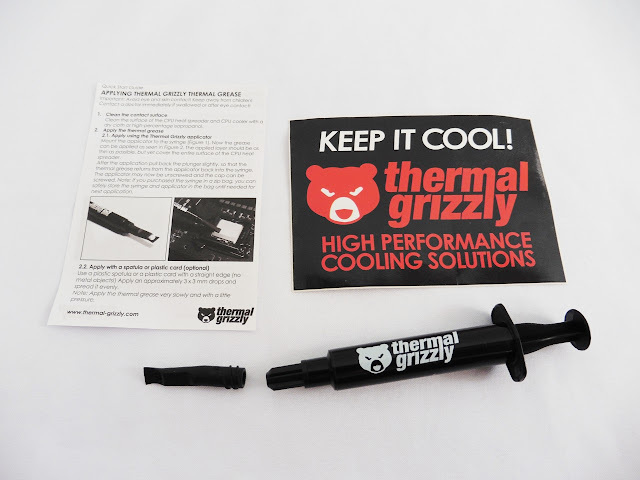 Inside the bag, you’ll find a quick start guide, Thermal Grizzly sticker, a rubber TIM applicator to be attached to the syringe, and finally the syringe containing the Kyronaut thermal compound. 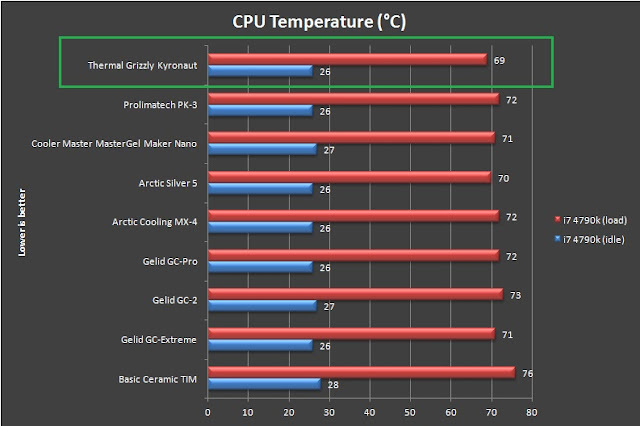 As the heat is ramped with prime95 for maximum heat output, the temperature is observed spiking up to the range of 76°C ~78°C during the first set of the test. Lower temperature reading can be observed after a few days across all the thermal compounds used in the test, displaying different curing time of its own. 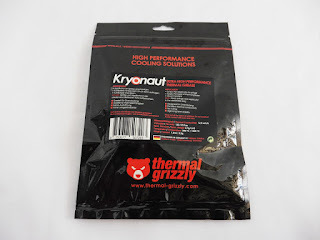 The Thermal Grizzly Kyronaut performs a whole lot better than expected, beating some of the market-leading thermal compounds with the least curing time and best thermal performance displayed. 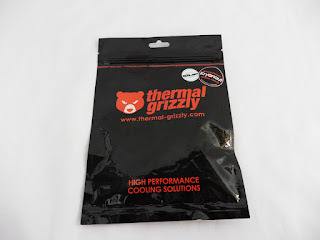 With such excellence displayed throughout the test, we have no reason to doubt that Thermal Grizzly Kyronaut will be very soon one of the most popular thermal compounds used by PC enthusiasts and overclockers around the globe. If you find that $29 for the 11.1 Grams syringe is an overly expensive amount of money to pay for a thermal compound, here’s the deal: it beats pretty much all of the popular high-performance thermal compounds available on the market as of today, and you can opt for the $12 1g syringe, which is more than enough for few times of generous amount of pea-size application. Thermal Grizzly Kryonaut is an awesome stuff BUT I must inform you that your mileage varies, depending on what your heat source (CPU, GPU, which model…..) and cooler type is. But overall, it is a precious product that can easily gain the admiration of every user who cares most for performance.